The 100th Round: 100 Codeforces T-shirts! New Year Holiday is a time of miracles and gifts! Quite by chance the 100th Codeforces round coincided with this wonderful moment. It will be a combined round, that is, participants Div1, Div2 and newcomers will compete with one set of problems. To make it interesting for each participant we plan to expand the round to 6 problems. 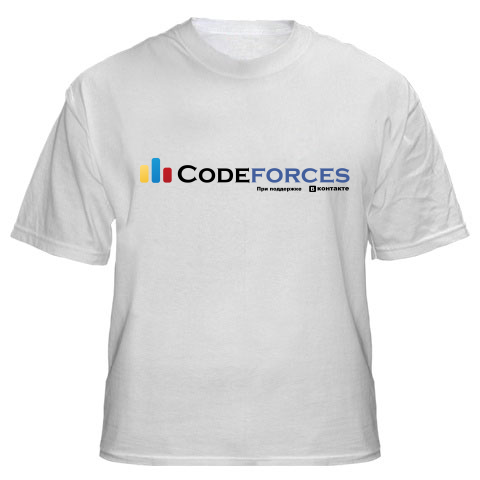 The most important thing: the best hundred participants of the 100th round will receive an exclusive Codeforces t-shirt! It's better to provide some lucky T-shirt for randomized participants, or it's almost impossible for most people to get that valuable gift. It's honest that valuable gift those will take who deserve that one. Yes, I agree. Actually I'm on the way of being better, hope one day I'll be qualified enough for a T-shirt. Glad to hear it. Keep on moving, Codeforces! Oh, God. Let me have that shirt! Can it be randomized for something like the first 500 contestants ? What for? Just imagine: someone will win this contest, and you will get 493th place (it is just an example). And you will get the T-Shirt, but winner won't get it. Is it an honest game? No. If you think that you must win this T-Shirt then you have 11 days to prepare for this contest. Good luck! I don't agree with the randomization at all. If the reason of doing this is because some people think it's impossible for them to get a t-shirt, so I think the winner of the next TCO should be selected randomly. I think that you guys are right with what you are saying ..
Good luck with the contest :) .. I think we can make another kind of gift (as badges or something like that beside the t-shirt) to be given to other contestants rather than the top 100 to increase the range of winning a gift. Wow ^_^ the T-shirt was so cool! I like this T-shirt.It's so cool~~~But it's too cold to wear in the winter...Haha! Good News!It is a big challenge.I'm sure everyone will happy to take part in this contest. Then the number of participants in division 2 would increase significantly compared to division 1 (Easier challenging, Easier problem set). And the contest would become a fast-coding-contest instead of a real brain-battle. Moreover, why did you say it is "not fair"? Not giving a prize does not mean "unfair" ! This only gives the contestants in division 2 more motivation for becoming better. I don't think that becoming a top in division 2 easily is more valuable than gaining real knowledge and real experience with other good coders in division 1. If you do not face the challenges head-on, it will take you a long time for becoming better. Yes, therefore I ask the admin to allow any div2 coders to register in div1 match. I don't see that you requested our addresses in our profile information :D .. I think this should be updated ! When I unofficially participated some Div 2 round, I found that Div 2 coders often have better chance to hack since people in their room seem to make more mistakes. So, will it be fair if some people register new IDs to compete in Div 2 rooms? I think rooms should include both Div 1 and Div 2. Moreover, hacks on this problem would require less time than this one. (EDIT) I'm sorry, I forgot that the problem set in the round #100 will be shared. I didn't change my mind, however - will Div1 coders make this many mistakes in this problem? Even though round #100 will be a combined one, I might still create a new account just for that precious T-shirt, if I could compete in a Div2 room (well, now that I posted this, I promise I won't). At first, rooms definitely will be joint for all divisions. At second, since there will be common problemset - your second argument is void. Check some recently combined rounds, 88 and 90. There are separated rooms for div 1 (from room 1) and div 2 (from room 50). They wasn't truly combined, just Div1+Div2, but in same contest. Completely combined rounds was in Yandex.Algorithm. With 2012 being the last year before world's end and all the new codeforces contest comming up, I wondered if there is any plan for an automatically maintained Google Calendar showing us the upcomming Codeforces Events ? Server time: Apr/19/2019 01:31:56 (f2).